For a city known for constant rain, I have had fabulous luck when visiting Seattle. The first time I visited was nearly five years ago with my parents, but recently, while living out in California, I had the opportunity to spend a long weekend in the city again. Seattle is wonderful – one of my roommates in California said that within a few hours she had already pictured herself living there. And I can’t say I disagree – while I found I liked Portland slightly more, Seattle is a beautiful city I could easily find myself living in. Below are some of my favorite Seattle attractions, some of which I’ve had the fortune of visiting multiple times. My absolute favorite part of Seattle without a doubt is the Chihuly Garden and Glass, a museum filled with the glass art of Dale Chihuly. Only a few minutes away from the Space Needle, the Chihuly Garden and Glass is one of the most stunning museums I have ever visited. The first time I went to the Chihuly exhibit was by chance. My family and I had some time to kill before our tour of the Space Needle, and you can purchase tickets to the Chihuly Garden and Glass museum for cheaper when purchasing Space Needle tickets. While my family was not especially interested in visting an art museum, it sounded better than waiting. I am so thankful we went. Each and every exhibit within the museum is better than the last. There are three main parts to the museum that I find particularly stunning: the galleries, the garden, and the glasshouse. The galleries are stunning, showing off tons of different works, including a collection of glass chandeliers, intricate vases, an indoor glass garden, and, my personal favorite, a ceiling composed entirely of glass that gives the room a rainbow glow. The garden is also nice, especially when the weather cooperates, as the glass sculptures are scattered among flowers of similar colors, making the art feel that much more alive. One of the most stunning parts, however, is the greenhouse. Chihuly was always a fan of conservatories and wanted to incorporate this interest into the museum. Therefore, as one of the last exhibits, you are able to walk into a 40-foot tall glass greenhouse, with only one piece of art on display. However, that piece is 100-feet long and suspended in the air. It is one of the most visually stunning works of art I’ve ever seen, and the natural light seems to illuminate it to a degree that wouldn’t be possible within a museum. 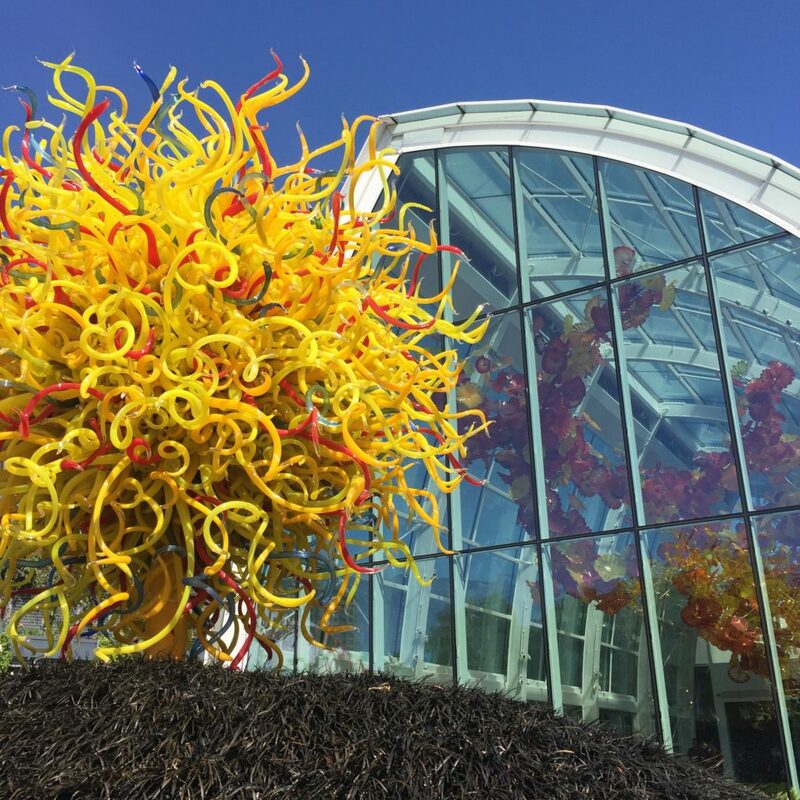 Without a doubt, if you are visiting Seattle, the Chihuly Glass and Garden museum is a must do. I love a good market and thankfully Seattle delivers on this account. Located right on the water, Pike Place Market is a fun way to walk around and see local artists’ work, as well as pick up some ingredients for dinner, which my friend and I did when we visited. It’s a bit crowded and at times you feel like you are being shuffled along, but it’s a fun place to visit. The most famous part of Pike Place Market is most likely the Pike Place Fish Market, where employees will throw big fish around the shop. When I was younger I remember finding this action exciting and exhilarating, wondering how they managed to catch the fish each time without dropping it. During my second visit it wasn’t as exciting, but it was still worth witnessing. While at Pike Place, a visit to the Gum Wall is a must as well. While actually gross if you think about it for too long, the Gum Wall is an alley featuring thousands of pieces of gum. 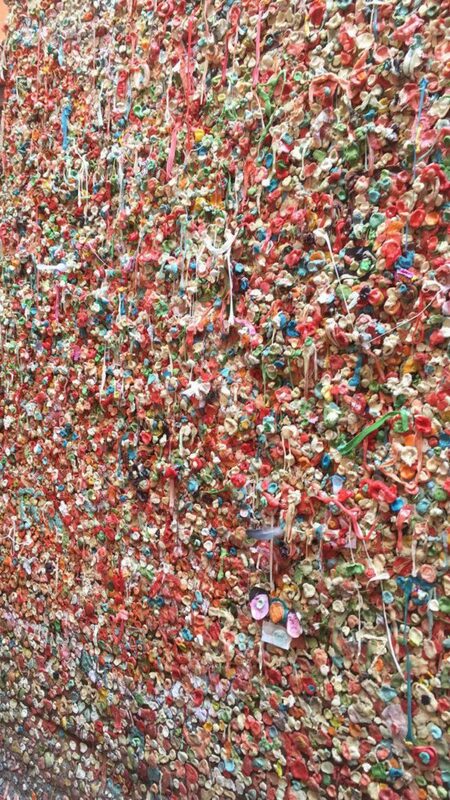 I overheard a tour guide telling her tour that the reason for this is because back in the day people used to stick a coin to the wall using gum for good luck, but someone came by and took all the coins, leaving a wall of gum. Although the city cleaned it up at one point, the gum collection was restarted, creating a place for tourists to add their mark to the city. My favorite movie is the 1999 classic ‘10 Things About You.’ The movie is set in Seattle, which helped me figure out some places I wanted to check out. One of the scenes in the movie has two characters climbing down from what appears to be a giant sculpture of a troll. While the movie doesn’t comment on the fact there is a random troll in Seattle, I wanted to see this sculpture in person. 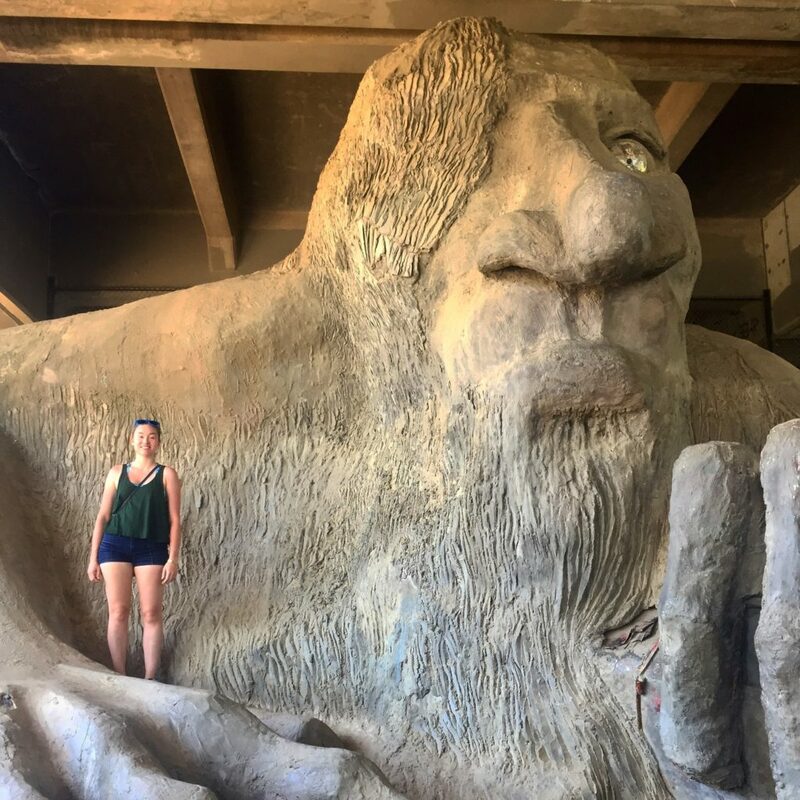 Under a bridge in Fremont is where the Fremont Troll lives. It’s gigantic, as well as free to climb. One of the weirdest attractions I visited in Seattle for sure, but as odd as it was to climb on the shoulder of a giant troll underneath a bridge, it was also a ton of fun laughing at the ridiculousness of the situation. Fremont by itself is a cute town as well, so it makes the trip to the troll that much more doable. One of my favorite neighborhoods in Seattle was Pioneer Square, located in Downtown Seattle. Pioneer Square felt right like home to me – while I can’t pinpoint exactly what it was, it had a vibe similar to that of Boston, making me feel like I belonged straightaways. The Square was filled with art galleries, bookstores, and cafes, some of my favorite things. One of the main places in Pioneer Square I hung out in was Occidental Park. A public square surrounded by restaurants, my friend and I decided after a long day exploring we wanted to take a break, which Occidental Park was perfect for. Beyond the cafes and public art, there were also ping pong tables, basketball courts, and Foosball tables open to everyone, as well as tables and chairs to sit and relax in. Once we felt rested, we went to check out another part of Pioneer Square: Smith Tower. Smith Tower has an observatory on the 35th floor, and while not the tallest building in Seattle (that honor goes to the Columbia Center) when Smith Tower was first built it wasn’t only the tallest building in Seattle, but the tallest building west of the Mississippi. 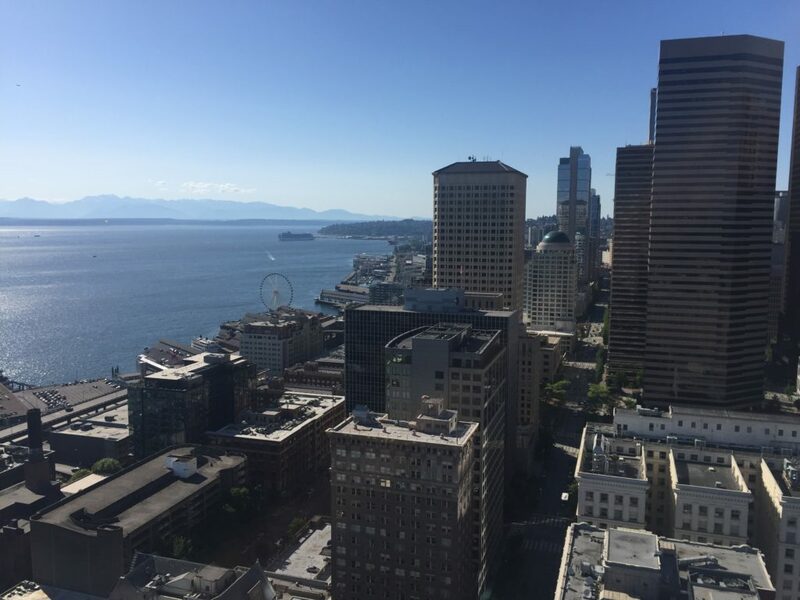 I enjoyed touring Smith Tower because the small museum leading up to the observation deck included the history of the building, as well as of Seattle during the early 1900s, and while it isn’t the tallest building in Seattle, you are able to see the surrounding area pretty clearly in part because you aren’t too high up. The Museum of Pop Culture, known as the MoPOP, is one of those museums you either love or you hate. Or, if you are like me, one you change your mind on depending when you visit. 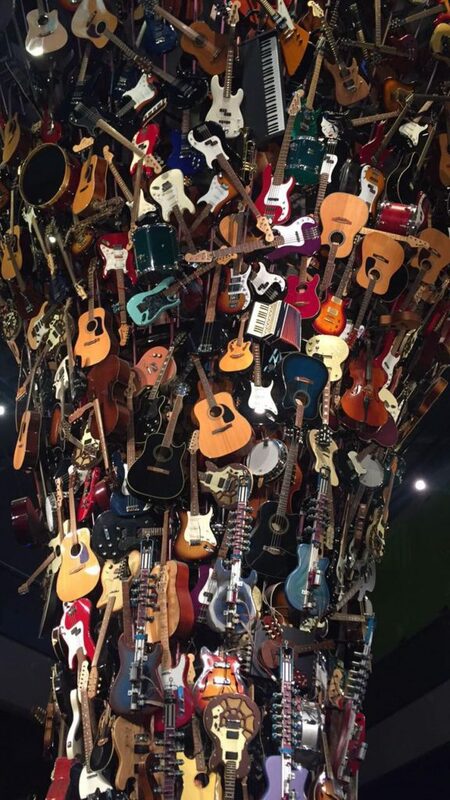 The first time I visited the MoPOP, when I was about sixteen, I thought it was boring. I’m not the biggest music fanatic, so many of the exhibits fell flat for me. Reading about the history of different musicians and guitars was interesting on an intellectual level, but I wasn’t excited at every turn. During my recent Seattle visit I had a completely different experience. While there was still a ton of exhibits on musicians, the number of exhibits on movies, video games, and sports also increased. For movies, there were entire exhibits dedicated to fantasy, science fiction, and horror, as well as a special exhibit on Star Trek. Each one of these exhibits was so intricate it was amazing. For example, the fantasy room feels as though you are walking through an enchanted forest, while the Star Trek exhibit is set up as though you are onboard the Starship Enterprise. The immersive experience was fantastic, and something I love in museums. The expansion of the MoPOP transformed the museum from something I could skip to a must see Seattle attraction in my book, but for those unsure, I would highly suggest checking out the exhibits online first before deciding whether or not to visit. One of the most visually recognizable attractions in Seattle is the Space Needle. The observation tower is an interestingly designed building, similar to the Vancouver Lookout but much slimmer. The first time I visited Seattle my family and I went up to the top. While it was cool going up such a famous landmark, the problem with doing that is that when you go up and take pictures, you miss the opportunity to have arguably the most famous building in Seattle in your pictures. The Space Needle as a whole is just interesting. Hanging around the Space Needle is relaxing, as there is an expanse of grass surrounding it. The building is also located in the Seattle Center area, which is surrounded by other attractions like the Chihuly Garden and Glass museum and the MoPOP. 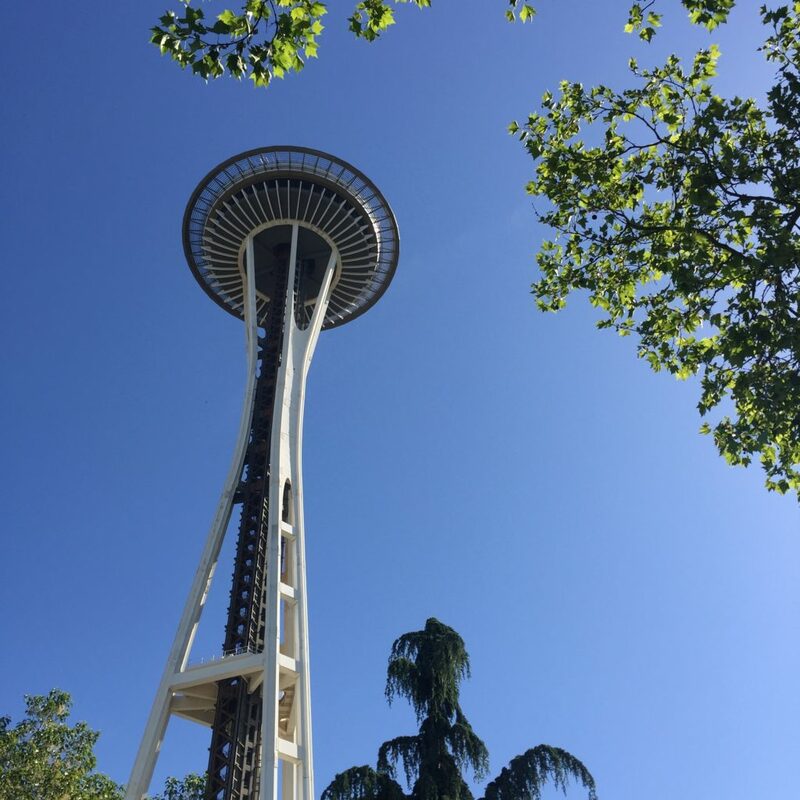 If you have the money going up is fun, but if not you still should make sure you don’t miss out on seeing one of the most famous Seattle landmarks up close. Seattle is an awesome city to visit, whether for a few days, a week, or even as a pit stop before a cruise. While I haven’t actually ever visited the city while it was raining heavily, as it is known to do, I can’t imagine that it could even take away from the excitement of the city. This entry was posted in North America, Travel and tagged art, market, museums, seattle, travel, washington. Bookmark the permalink.